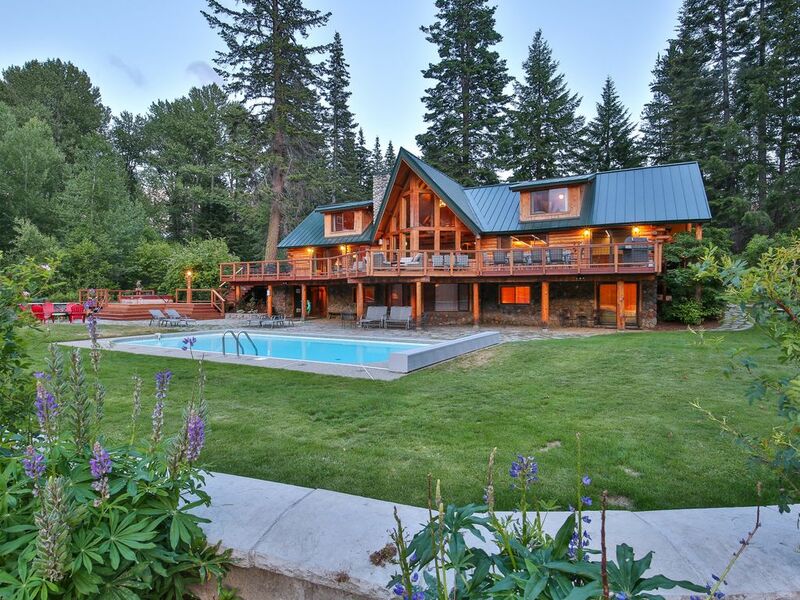 Whether you're golfing, fishing or rafting on the Wenatchee River, hiking in the Alpine Wilderness Area of the Cascades, rock climbing near Leavenworth, enjoying a scenic wine tour, or just enjoying the 12 acres of grounds and amenities at the Lodge~ you are sure to create wonderful memories. The Lodge has been a part of our family from the Seattle are for many years, we enjoy allowing others to come vacation at the Lodge and make special memories. Over time we have worked hard to keep the Lodge in top shape to be enjoyed by our family and those who stay for vacations often year after year. The Lodge is a very special place ~ we hope you will chose the Lodge to make special memories of your own! The Lodge has an amazing setting on the confluence of the Chiwawa and Wenatchee Rivers, we have fields, beach, a private pool open in summer, private tennis court with basketball hoops, fire pit, large hot tub, expansive deck overlooking the Wenatchee River, a large outdoor chess set, children's log play house, something for every age! Well appointed amenities and space for multiple families to gather and enjoy the property and the surrounding area. Heaven Can Wait Lodge has an unparalleled setting on 12 acres on the Wenatchee River- complete privacy and amenities that make a stay truly memorable. 12 private acres on the Wenatchee River. All bed linens, blankets and comforters are provided. Stacked washer and dryer available for your use. Laundry soap provided. Bathroom as well as hot tub/pool towels. Two Lopi wood stoves with glass doors. One in main living room, one in downstairs media living room. Two living areas, one on main floor with windows overlooking the river, downstairs is the Media living room with flat screen tv and cozy seating. Two Dishwashers and two sinks make cooking prep and cleanup for large groups functional and easy. 3 refridgerators available for guest use, with freezers and ice makers. 6 Burner Viking range makes cooking for large groups a breeze. Two coffee makers available for use, we provide paper filters, there is a coffee grinder also; just bring your own coffee! Plenty of dishware and serveware for large groups. Very well equipped kitchen with many pots/ pans/ bakeware and gadgets for your use. Dining seats 16, table in kitchen allows the Lodge to seat 20+ people with ease. There is also an outdoor table for dining outdoors in summer months. TV in Master bedroom has expanded cable. Large flatscreen TV in downstairs living area has Blu-Ray DVD player and expanded cable service, it is also a smart TV. Downstairs media living room has large flat screen TV, DVD Player and expanded Cable service. Speakers inside and out (outdoor deck speakers on front porch and back deck) zones can be adjusted as desired. There is an aux cable with the stereo system, so you can plug in your phone or iPod. Blu-Ray player with TV in Living Room/ TV Room downstairs. Billiards room has billiards table, foosball table, and a card table. Billiards table in game room with foosball table and game/poker table. Childrens play room on 3rd floor, filled with books and toys! Front lawn as well as around the pool -- lots of space for lawn games or just relaxing. Large deck overlooks pool/ hot tub and the Wenatchee River. Steven Pass is 30 minutes from the Lodge. Private tennis court -- bring your racquet and tennis balls! Open Mid-May to Mid October. Kahler Glen golf course is a quick 10 minute drive from the Lodge. Cedar lined Sauna near billiards room on ground level; accomodates 6 people. Open during summer months, Mid May- Mid September. Heated Memorial Day through Labor Day. 8 person outdoor hot tub open year round and professionally maintained weekly. Full size private tennis court and basketball on site as well as kids log 'playhouse' and horseshoe pit. The property sits on the confluence of two rivers, there is a large beach and trails through the woods to explore, a one of a kind setting! HWC does it again for our large family!!! Another successful year for our large family winter getaway. Great views and enough space for large groups. From the ones that like to relax in the sauna to the adventurous type that can enjoy the surrounding beauty of the outdoors, this place has it all. Shannon makes it a lovely stay by being a great host and always answering any questions that may come up. Thank you!! We will see you next year. This is such an amazing house! We had 28 ladies move in for the weekend and there was PLENTY of space for all of us all throughout! We had more than enough space for the meals, for gatherings and for simply hanging out. What a wonderful space! PLUS the surroundings! Every room has a few, truly! WOW! I would highly recommend this house to anyone that wants to get away. This is a beautiful lodge surrounded by wilderness, not neighboring cabins. Owner takes great care in this facility as it is highly organized, uncluttered and clean. We have 17 total with 3 toddlers ... it was fabulous - the men had such a great time playing in the game room. The hot tub and sauna were a huge hit! Rooms were fabulous ... and the kitchen! WOW .. We are ready to return in the summer to enjoy the grounds and all the activities! Shannon was so responsive during the whole planning process and follow-up. Spend the most wonderful weekend at the lodge. Views from the lodge are breathtaking. Plenty of room for everyone - we were a group of 5 families , including adults, young adults and pre teens. Kids had a nice time in the game room and grounds. We adults enjoyed the kitchen and family room. Really impressed with the kitchen - perfect for cooking for large groups - plenty of room & supplies for all the cooks in the group. This was our 3rd stay at this lodge. We surely will be back again. Two grandparents, four married children, fifteen grandchildren ages 15 years to two months for a total of 25!. The dorms were great for the kids, each couple had their own headroom. Swam a lot, white water rafting, shopping season Leavenworth and a trip to Rocky Reach Dam. We had a great time and the house worked well. The Lodge is located conveniently halfway between Stevens Pass and downtown Leavenworth. The tiny town of Plain is nearby with a small grocery, a quality family run restaurant, and the “Hardware” store which also has espresso stand, fun gifts, clothing, accessories and home accents, not to be missed! The Bavarian village of Leavenworth is a pretty 25 minute drive down the Chumstick HWY with many festivals, delicious dining options and shopping in a gorgeous setting. The Lodge’s own 12 acres of privacy is a one of a kind home base for gathering family and friends. We accept reservations up to One Year in advance. If interested in dates further than one year in advance we keep a wait list (we offfer first option to return the following year to the current years guests, if they do not re-book we open the dates to those on the wait list). Rates stated are for up to 14 people, added guests are $35.00 each per night, no charge for children under age 2 at dates of stay. Certain time periods require 3 or 4 night minimum stay (i.e. peak summer Months and over Holidays and Leavenworth Festivals, please enquire for details). 26 people is maximum occupancy at any time, no events/ groups larger than 26. We have a 60 day cancellation policy - please enquire for details.